To Make Lemon Cheesecakes to keep 7 [years?] 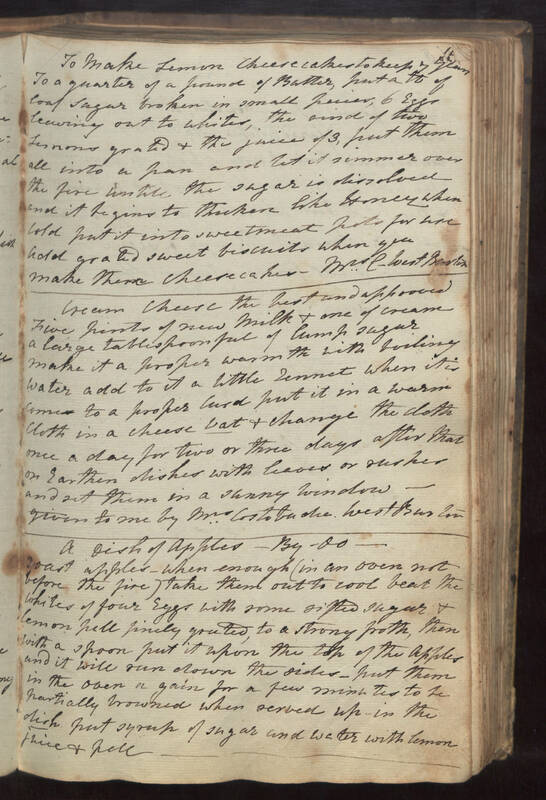 To a quarter of a pound of Butter, put a lb of loaf sugar broken in small peices, 6 Eggs leaving out to whites, the rind of two Lemons grated & the juice of 3, put them all into a pan and let it simmer over the fire untill the sugar is dissolved and it begins to thicken like Honey when cold put it into sweetmeat pots for use add grated sweet biscuits when you make these cheesecakes. Mrs C- West Burton Cream Cheese the best and approved Five pints of new milk & one of cream a large tablespoonful of lump sugar make it a proper warmth with boiling water add to it a little rennet when it is come to a proper curd put it in a warm cloth in a cheese vat & change the cloth once a day for two or three days after that on Earthen dishes with leaves or rushes and set them in a sunny window. given to me by Mrs Costobadie West Burton A Dish of Apples - By - Do = Roast apples. when enough (in an oven not before the fire) take them out to cool beat the whites of four Eggs with some sifted sugar & lemon pell finely grated, to a strong froth, then with a spoon put it upon the top of the apples and it will run down the sides. put them in the oven a gain for a few minutes to be partially browned when served up - in the dish put syrup of sugar and water with lemon juice & pell.